So, one final post before we look at the steps to read a horoscope. This post relates to 3 things, i.e. 3. Charan or Pada (steps). 4. Condition of Ascendant Lord and Moon. 1. Ascendant Lord and its position in chart shows the direction in which your life will go. Like in this picture, Ascendant is Scorpio, Lord of Scorpio is Mars. Now, wherever Mars is placed in horoscope, the person will follow that path in life, depending on the dignity of planet. So, if Mars is in 6th house in Aries, this person's life path will be to deal with obstacles, enemies and disputes. 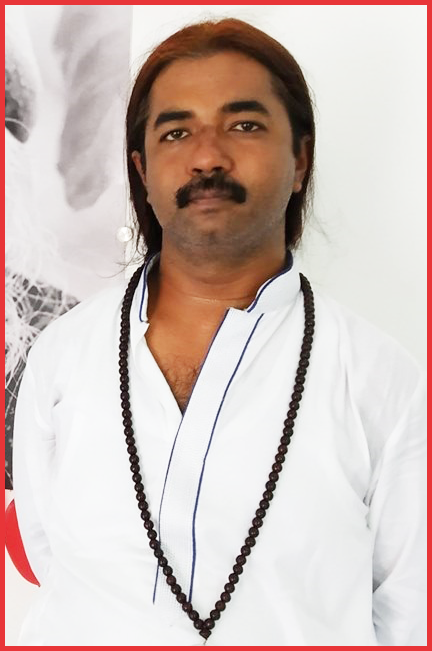 If Mars is in 9th house, then this person will spend lots of time in religious activities but he will try to be dominant there, means he thinks he is better than his Gurus, which actually he might be, no big deal. If Mars is in 8th house, this person's life focus would be to research and to bring the secrets of the other world in front of every one. 2. Ascendant Nakshatra - Ascendant Lord shows the direction of life, whereas Ascendant Nakshatra will show the pattern of life. 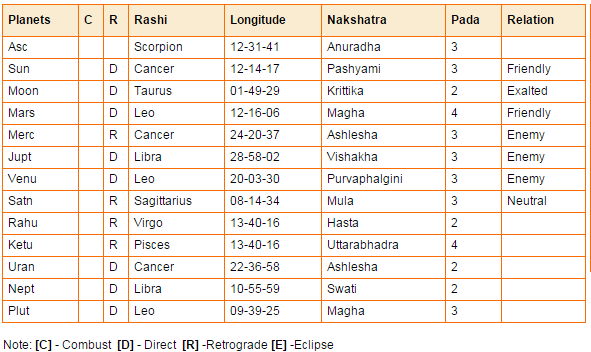 Please find introduction of all the Nakshatras here - http://astrosaxena.com/Nakshtra. Like, in this horoscope, Ascendant Nakshatra is Anuradha. Anuradha can be broken as Anu + Radha. It literally means Following Radha or Following Your Desires (Radha as manifestation of desire). So, this person is more a desire oriented person, he will follow the life path shown by Ascendant Lord only to fulfil his desires (Anu + Radha). 3. Charan or Pada (Steps) - Every Nakshatra is further divided in 4 Padas (steps). These steps are nothing but 4 Purusharth of our life, i.e. 1. Dharma (Duty), 2. Artha (Purpose), 3. Kama (Desire) and 4. Moksha (Liberation). Now, in which Charan or Pada, Ascendant Nakshatra is will decide the tendency of person behind taking particular actions as per Ascendant Lord and Ascendant Nakshatra. Like, if Ascendant Nakshatra is in 1st pada of Dharma, this person will take actions as per his Ascendant Lord and Nakshatra, considering it as his Dharma or righteoud duty towards God and others. He wont think if he is getting any return or not. Taking the action itself is most important for him and the reward too. Now, if Ascendant Nakshatra is in 2nd pada of Artha, this person will take actions as per his Ascendant Lord and Nakshatra but he will think about the purpose for which he is taking the action. Not necessary that purpose should be his individual gains, he can do it for the larger gains of everyone. If Ascendant Nakshatra is in 3rd pada of Kama (like in this chart), this person will take actions as per his Ascendant Lord and Nakshatra but his own desires will take priority before any other thing. An aspect from Jupiter or Venus on Ascendant can change this situation. If Ascendant Nakshatra is in 4th pada of Moksha, then this person will take actions as per his Ascendant Lord and Nakshatra but now the actions will be taken with the intention of receiving Moksha (liberation). 4. Condition of Ascendant Lord and Moon - To live a decent life it is very important that condition of Ascendant Lord and Moon should be good enough or even average because Ascendant Lord gives us realisation of the life path to follow and Moon represents mind. Needless to say how important it is to have a sound mind. For Cancer Ascendants, condition of Moon becomes more important as it is Ascendant Lord too. Tomorrow, steps of the horoscope reading.